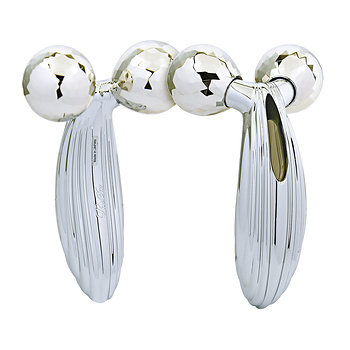 ReFa Carat Ray has the following features: Perfectly fits in your hand with a flowing, streamlined form. Features a large solar panel for generating ""microcurrent""*. The Double Drainage** Rollers grip and glide to replicate the ""kneading"" manipulations that help firm and tighten your skin. Helps rejuvenate your skin's radiance and suppleness with grip and glide action. Coated in a brilliantly bright platinum, it is compatible for even delicate skin. Conforms with JIS standards (equivalent to IPX7). This product can be used in the bathtub. Size: approximately 92mm ×149mm ×61mm Weight: approximately 196g Accessories: Instruction Manual, Guidebook, Pouch, Cleaning Cloth *Compared with ReFa CARAT. **Drainage is a technique that estheticians often perform, and is not meant to express any effect the product has on your body.